Fennec or fennec fox is the common name for a small, nocturnal canid, Vulpes zerda (synonym Fennecus zerda), characterized by very large, pointed ears, long tail, and highly social behavior. It is found in the central Sahara Desert as well as other desert and mountainous regions of North Africa. A nocturnal omnivore, at night the fennec hunts rodents, insects, birds, and eggs of birds and insects. Much of the its diet also is desert vegetation, from which the fennec gets most of its water. This consists of grasses, some roots, and some fruit and berries. Ecologically, in addition to helping in the control of prey populations, the fennec also is integral to desert food chains, providing food for vultures, hyenas, jackals, and various birds of prey (hawks, eagles). For humans, fennecs sometimes are raised as pets, being the only fox that can properly be kept as a household pet. While these nocturnal animals are difficult to spot in the wild, tending to stay in their burrows during the hot day, they are attractions in zoos. Despite these values, their populations remain at risk due to sport hunting and habitat disruption. There is debate among scientists as to whether the fennec fox belongs to the genus Vulpes (true foxes). It has uncharacteristic behaviors, such as packs, called "harems," while all other foxes are solitary. It also has only 32 chromosome pairs, while other foxes have 35 to 39. This has led to two conflicting classifications: Vulpes zerda, implying that the fennec is a true fox, and Fennecus zerda, implying that the fennec belongs to its own genus. Fennecs are the smallest members of the Canidae family and are smaller than an average house cat (Adams and Myers 2004). They have a body length of from 30 to 40 centimeters (12-16 inches), with the long tail adding an additional 18 to 30 centimeters (7-12 inches); they stand about 18 to 22 centimeters (7-9 inches) at the shoulder (Adams and Myers 2004). The ears are very large relatively, with the pinnae being about 15 centimeters (6 inches) long. Males reach up to 1.5 kilograms (3.3 pounds), but the females reach only about 0.8 kilograms (1.8 pounds) (Adams and Myers 2004). 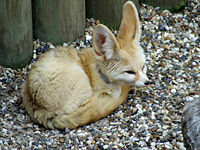 The fennec's distinctively long ears serve to scatter heat and to hear the movement of prey at night. Its ears, as well as the enlarged auditory bullae, are sensitive enough to hear large insects, such as beetles and locusts, walk on the sand, as well as prey under the sand. The coats of fennecs are often a sandy color on the dorsal surface, allowing them to blend with their desert surroundings. The coat is often white along the face, legs, and underside. The fennec's fur tends to be silky and thick. It reflects sunlight during the day and conserves heat at night. The soles of the fennec's feet also have thick fur, protecting them from the hot sand. The tail is black-tipped. There also is black on the vibrissae, rhinal pad, and over the violet gland (Adams and Myers 2004). 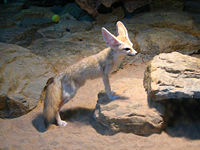 Fennecs are most common in the central Sahara. However, they also are found from northern Morocco, east to the northern tip of the Red Sea to Kuwait, and south into Chad and Nigeria (Adams and Myers 2004). Fennecs are adapted to desert life and found mainly in arid, sandy regions. Since desert grasses and other vegetation is used for water and for support and lining of their dens, the presence of such plants also is important (Adams and Myers 2004). Fennecs do not require free standing water, but can obtain their water from the vegetation. Unlike most foxes, fennecs are highly social, living together in family groups of up to ten members, including usually one breeding pair, a litter of immature pups, and perhaps some older siblings (Adams and Myers 2004). They have a number of vocalizations, including chatters, whimpers, wails, growls, and shrieks (Adams and Myers 2004). Fennecs tend to spend most of the daytime hours underground in burrows, while hunting at night. By sleeping during the day in burrows, they are protected from the hot sun of their desert environment. They did the burrows themselves, and the burrows can become extensive tunnel systems with several entrances (Adams and Myers 2004). Despite their gregarious nature, fennecs typically hunt alone. They are opportunistic hunters, feeding on whatever they can catch, including rodents, lizards, insects, eggs, and birds, as well as consuming fruit, leaves, and roots, with the plant materials also providing the source of water for the fennec. The breeding season is normally January through March. After about 52 days of gestation, a female gives birth to a litter of 2 to 5 young. She keeps males out of the den until the offspring are older. The young rely on their mother's milk for about a month. The mother may give birth once a year, although twice a year is possible but very rare. The fennec fox is classified under the Convention on International Trade in Endangered Species of Wild Fauna and Flora (CITES) as an Appendix II species: Species not necessarily threatened with extinction, but whose trade must be controlled to avoid utilization incompatible with their survival. It is often hunted by humans, though it does not cause any direct harm to human interests. Like other foxes, it is prized for its fur by the indigenous people of the Sahara and Sinai. The fennec fox is considered the only species of fox that can properly be kept as a pet. Although it cannot be considered domesticated, it can be kept in a domestic setting similar to dogs or cats. In the United States and Canada, there is a relatively established community of fennec fox owners and breeders. Pet fennecs, being the most social among foxes, are usually very friendly towards strangers and other household pets. However, they are extremely active, and need outlets for their energy; they may exhaust other household pets with their playfulness. Moreover, instinctual behaviors, such as hiding caches of food in case of famine and attempting to burrow into furniture to build a nest, can also add to the difficulty of their care. Fennec foxes often are not able to be housebroken, although a few owners have reported being able to litter-train their fennecs. Several factors make it important to ensure that a pet fennec does not escape. Its speed and agility (they can jump four times their own body length), along with their natural chase instinct, creates the risk of a fennec fox slipping its harness or collar. Since it is also an adept digger (it can dig up to 20 feet a night in its natural environment), outdoor pens and fences must be extended several feet below ground. Escaped fennec foxes are extremely difficult to recapture. Any diet in a domestic setting should reflect their diet in the wild. Though omnivorous, a great deal of their diet consists of meat and protein sources like insects. Food sources commonly used include high quality, meat-rich dog food, wild canine food brands, cat food, raw meats, insects, mealworms, and custom dietary mixtures. The legality of owning a fennec varies by jurisdiction, as with many exotic pets. Also, being considered an exotic animal, not all veterinarians will treat them. ↑ W. C. Wozencraft, "Order Carnivora," in D. E. Wilson and D. M. Reeder (eds. ), Mammal Species of the World: A Taxonomic and Geographic Reference. (Washington : Smithsonian Institution Press, 1993). ISBN 1560982179. ↑ C. S. Asa, C. Valdespino, F. Cuzin, K. de Smet, and T. Jdeidi, "Vulpes zerda," in IUCN, 2008 IUCN Red List of Threatened Species (Gland, Switzerland: IUCN, 2008). Retrieved December 1, 2008. Adams, R., and P. Myers. 2004. Vulpes zerda. Animal Diversity Web. Retrieved November 29, 2008. Larivière, Serge (2002). Vulpes zerda. Mammalian Species (714): 1–5. Retrieved November 30, 2008. This page was last modified on 18 October 2013, at 14:39.